Situated in Hangzhou and with Wushan Square reachable within 6 km, Park Hyatt Hangzhou features concierge services, non-smoking rooms, a fitness centre, free WiFi and a bar. Located in the Jianggan district, the property provides guests with access to a restaurant. The property is 7.5 miles from Lingyin Temple. The units in the hotel are fitted with a flat-screen TV. With a private bathroom equipped with a hot tub and free toiletries, some rooms at Park Hyatt Hangzhou also feature a river view. All units include a desk. A buffet breakfast is served each morning at the property. Speaking English and Chinese at the reception, staff will be happy to provide guests with practical advice on the area. Xixi Wetland is 9.3 miles from the accommodation, while Remnant Snow on the Bridge in Winter is 4.3 miles away. 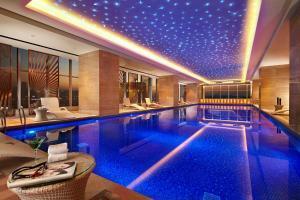 The nearest airport is Hangzhou Xiaoshan International Airport, 12.4 miles from the property. 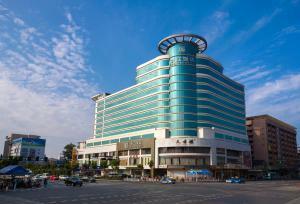 Haihua Hotel Hangzhou is situated in the commercial centre. 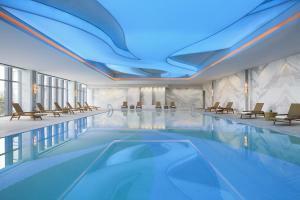 It offers an indoor pool, gym and 3 dining options. Free WiFi and free parking are provided. Hotel Haihua is a 15-minute drive from National Silk Museum and 3.7 miles from Lingyin Temple. 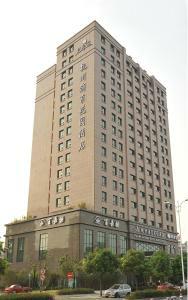 Hotel Haihua is a 40-minute drive to Hangzhou Xiaoshan International Airport. Hangzhou Railway Station can be reached in 18 minutes by car. 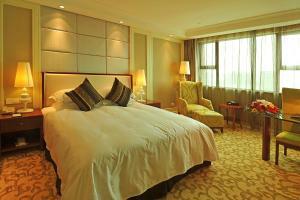 The cosy rooms at Haihua Hotel are brightly lit, featuring views of the city or West Lake. Each room is fitted with a TV and work desk. The private bathrooms come with bathtub and shower facilities. Other amenities include a minibar and refrigerator. Le Paris serves international buffet while Hemingway Steakhouse offers luxurious Western dining. For alternative dining choices, the Haihua Ge Chinese Restaurant serves traditional Cantonese and Sichuan cuisine. Only 1.9 miles from Zhejiang University, Pujing Garden Hotel features comfy accommodation with free wired internet access. It offers a games room, a tour desk and a business centre. Public parking is possible on site. 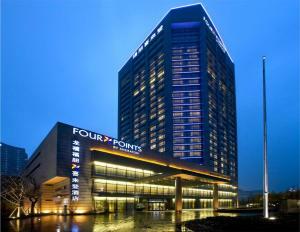 Pujing Garden Hotel is 6.2 miles from Xixi National Wetland Park and a 30-minute drive from Wulin Square. It takes 20 minutes by car to Hangzhou West Railway Station. Xiaoshan International Airport is about an hour’s drive away. Decoration in shades of apricot, all rooms come with free mineral water, a minibar, a flat-screen cable TV, an in-room safe, a work desk and a seating area with a sofa. The en suite bathroom has a hairdryer, soft bathrobes and a shower. Concierge service and luggage storage are provided at the 24-hour front desk. The business centre offers fax and photocopying facilities. Ticketing services are available at the tour desk. The on-site Chinese restaurant serves a fine selection of local Cantonese dishes for guests to enjoy. 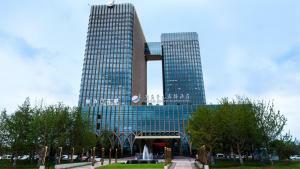 In the heart of the tourist attractions and business district, Ibis Hangzhou Huanglong Sports Center Hotel is just over half a mile from Hangzhou Huanglong Sports Center. 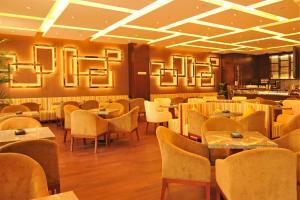 It provides meeting facilities and free Wi-Fi in the entire property. Ibis Hangzhou Huanglong Sports Center Hotel is 2 miles from the stunning West Lake, 5 miles from Hangzhou Train Station and 6 miles from Hangzhou East Train Station. Xiaoshan International Airport is 21 miles away. Decorated in warm colors, each guest room is furnished with a flat-screen TV with cable channels, a work desk and an electric teakettle with free bottled water. The attached bathrooms have shower facilities and free toiletries. A hairdryer is provided. The hotel has a business center for guests who would like to catch up on some last-minute work. Dry cleaning and luggage storage services are available. The on-site restaurant serves daily breakfast. 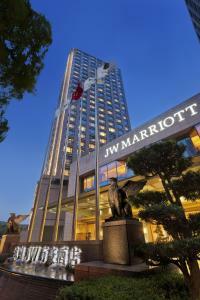 JW Marriott Hotel Hangzhou is located near Wulin Square, a 10-minute drive from the scenic West Lake and a 3-minute walk from Hangzhou Tower shopping mall. Adjacent to The Grand Canal, the stylish hotel features an indoor pool, a 24-hour fitness centre and free parking. 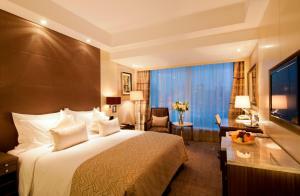 Air-conditioned guestrooms feature spacious interiors with modern decor. Each well-appointed room has a minibar, a capsule coffee machine, ironing facilities and a flat-screen TV with cable channels. Chargeable wired internet and Wi-Fi are also provided. JW Marriott Hotel Hangzhou is a 22-minute drive from Lingyin Temple, a 24-minute drive from Leifeng Tower and a 33-minute drive from Xixi National Wetland Park. It is also 3.1 miles from Hangzhou Railway Station. Xiaoshan Airport is located 18.6 miles from Hangzhou JW Marriott. 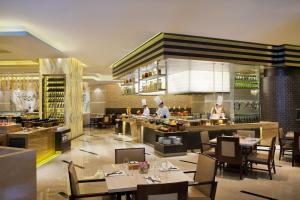 The on-site restaurant Asia Bistro offers Asian buffet spreads and unique live cooking station serving fresh food. Cantonese cuisine can be enjoyed at the Man Ho restaurant. CRU Steak House is well-known for its steak, fresh seafood and great selection of wines. Other dining options include a lobby lounge and Velocity Bar, a new contemporary sport bar. Guests can relax with a massage at the spa, or make travel arrangements at the concierge. There is also a business centre and meeting facilities on site. Car rentals, laundry and dry cleaning services are available. 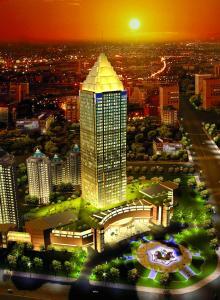 New Century Grand Hotel Hangzhou is situated in the CBD area of Xiaoshan District. 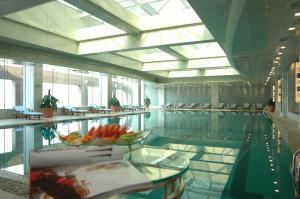 It features an indoor swimming pool, a fitness centre and 5 dining options. Free WiFi is offered. 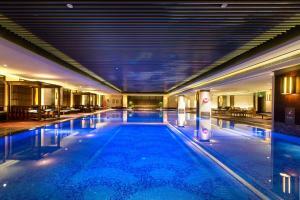 New Century Grand Hotel Hangzhou is a 45-minute drive from Hangzhou Xiaoshan International Airport. People's Square is 5 minutes' walk from the property. Hangzhou South Railway Station can be reached in 11 minutes by car, while Hangzhou East Railway Station is 40 minutes' drive away. It takes 40 minutes driving to West Lake. 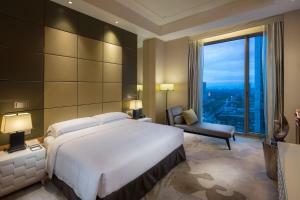 Rooms at the New Century Grand Hangzhou come with a flat-screen satellite TV, a minibar and a safe. A tea/coffee maker, bathrobes and slippers are provided. Guests can enjoy massage services or relax at the hotel’s spa. Laundry and dry cleaning services are available at the hotel. 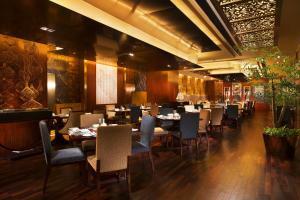 Hangzhou and Cantonese cuisines are served at Four Seasons Chamber Restaurant. The Montalcino Grill offers Western meals and Yimariga Restaurant features Japanese food. Sitting in the northwest corner of the alluring West Lake, Four Seasons Hotel Hangzhou at West Lake boasts views of traditional Chinese gardens from most units. 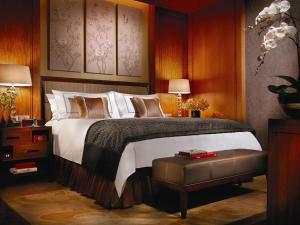 Four Seasons Hotel Hangzhou at West Lake is around a 10-minute walk from West Lake Impression show theatre. It is around a 20-minute drive from Hangzhou Railway Station and around a 50-minute drive from Hangzhou Xiaoshan International Airport. Rooms are decorated with satin embroidery on which traditional Chinese flowers and birds are painted. Fitted with carpeted floor, all soundproofed rooms come with an easy chair, a sofa, writing desk, side table and a flat-screen TV. The private bathroom has a bathtub, a separate glass shower stall with a rainshower and a large basin vanity with television. The property offers an indoor pool, meeting and banquet facilities, spa and wellness facilities and WiFi in all rooms and dining areas. The property’s concierge team helps guests to organise excursions with ticketing services. Luggage storage and currency exchange can be found at the 24-hour reception. For family with children, a playground and babysitting services are provided for guests’ convenience. After a long journey, relaxing on the sun terrace is a nice choice. For those who wish to explore the city by themselves, bikes are available. Dining options are available at the 2 on-site restaurants. Jin Sha serves Hangzhou, Shanghai and Cantonese food, while WLB serves continental cuisine. Afternoon tea and cocktails can be enjoyed in the lobby lounge. DoubleTree by Hilton Hangzhou East is located in Hangzhou Economic & Technological Development Zone, a 10-minute drive from Qiantang River. 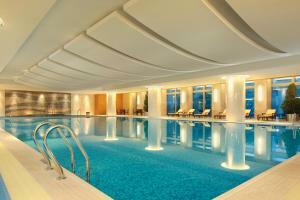 It offers an indoor pool, a fitness centre and a business centre. The scenic West Lake is a 40-minute drive away. DoubleTree by Hilton Hangzhou East is right next to Exit B of Jinshahu Station of Subway Line 1, only a 10-minute walk from Times Paradise Walk. 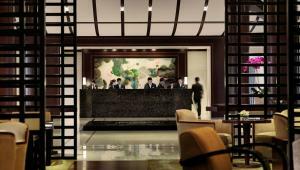 DoubleTree by Hilton Hangzhou East is a 10-minute drive from Hangzhou Coach Centre and a 30-miniute drive from Wulin Square. Hangzhou East Railway Station is a 20-minute drive away. Xiaoshan International Airport is a 30-minute drive away. Rooms here will provide you with a flat-screen TV, air conditioning and a minibar. There is a refrigerator and an electric kettle. Featuring showers, private bathrooms also come with a bathtub and a hairdryer. 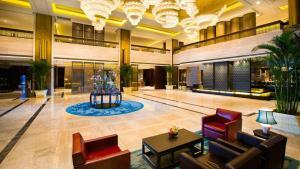 At DoubleTree by Hilton Hangzhou East you will find meeting facilities, ticketing service and a tour desk. The meeting room area is around 1000 square metres. An array of activities can be enjoyed on site or in the surroundings, including billiards. Heyuan Chinese Restaurant serves local Hangzhou cuisine and Cantonese food, while buffet spreads can be enjoyed at E café. Having successfully hosted many distinguished guests such as Turkish President delegation during G-20 summit, Grand Metropark Hotel Hangzhou is a nice choice for your stay in Hangzhou. It is conveniently positioned a 5-minute walk from the scenic West Lake and only 550 yards away from Exit D2 for Longxiangqiao Station (Line 1). The luxurious hotel offers 3 dining options, a bar, an outdoor pool and free internet access. The bus stop for Airport Express Line 2 is directly at the hotel main gate, making it super convenient to access the airport by bus. Impression West Lake lays 1.9 miles away, while Hangzhou Urban Balcony is 2.8 miles away. Also, Grand Metropark Hotel Hangzhou is just 1.2 miles from Hangzhou Railway Station and 4.3 miles away from Hangzhou International Expo Centre. Hangzhou Xiaoshan International Airport is 17.4 miles away. Free parking space is provided. 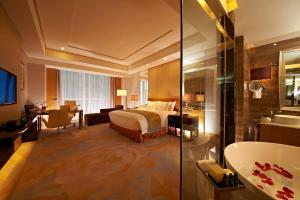 The spacious 368 rooms at Hangzhou Grand Metropark feature beautiful views of the city, mountain or lake. Some of them are furnished with traditional local charm. Each has a minibar, satellite TV and work desk. En suite bathrooms come with a bathtub. Free WiFi is covered. A wide range of leisure activities is provided here, including a gym, tennis, karaoke, billiards, and a swimming pool (open only in summer). Fitted with quite a few meeting rooms and a large multi-functional banquet hall covering more than 600 square metres, the hotel can be an ideal spot to host conferences, celebrations or wedding parties. Peony Chinese Restaurant serves authentic Chinese dishes and Dim Sum. 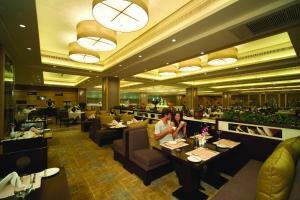 Other dining options include Japanese and Western food, serving delicacies prepared by seasoned chefs. For a night cap, you may try a glass of wine or cocktail at the bar. With a prime location in the central area, the hotel also offers easy links to many dining spots on Nansong Imperial Street, Nanshan Road Bar Street and shopping venues as Hubin Intime and Silk market nearby. Located in Xiaoshan District, Grand Parkray offers you comfort and luxury with sumptuous guestrooms, modern in-room and property facilities as well as convenient guest services. Blending in by splashing around in the indoor swimming pool, lazing in the hot tub, enjoying a soothing massage or dining at the 3 on-site restaurants with international flavors seems nice. Additionally, free Wi-Fi is available in all areas and free parking is provided. Hangzhou Grand Parkray is 50 yards from Xiaoshan Jianshe Sanlu Subway Station (line 2), which links to Hangzhou East Railway Station and downtown Hangzhou, 1.9 miles from Yinlong Department Store or Henglong Plaza. It is 7.5 miles from Hangzhou Railway Station and 11.2 miles from Xiaoshan International Airport. It also has easy access to Xiaoshan, the financial, commercial and entertainment district of Hangzhou. Offering large windows and chic design, each unit is fitted with a flat-screen cable TV, electric kettle, in-room safe and ironing facilities. It also comes with a minibar, fridge, work desk and seating area with a sofa. 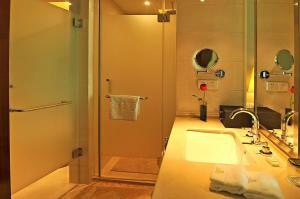 The en suite bathroom provides a bathtub, soft bathrobes and shower facilities. You may arrange your trips from the tour desk, catch up with your work at the business centre or play a game of billiards or table tennis after a day of tours. If you need the assistance, staff will be glad to help you with accommodating car hire and ticketing services. Provence restaurant serves a fine selection of refined French cuisine, while Yuet House serves authentic local Chinese dishes. Italian dishes are available at the restaurant on the 37th floor. The luxurious Zhejiang Hotel is located in downtown Hangzhou, just a 5-minute walk from Wulin Square and a 10-minute walk from West Lake. Fengqi Road subway station (line 1 and 2) is just 20 yards away. 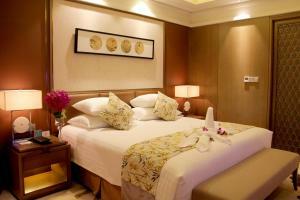 The hotel features the famous Tian Xiang Lou Restaurant and offers free parking on site. Air-conditioned guestrooms feature modern interiors and furnishings. 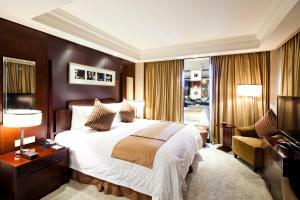 Each room is well-equipped with a minibar, tea/coffee making facilities and a large flat-screen TV with cable channels. 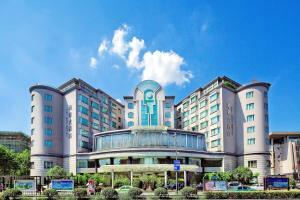 Zhejiang Hotel is 2.5 miles from Hangzhou Railway Station and 18.6 miles from Hangzhou Xianshan International Airport. Tian Xiang Lou serves a variety of local cuisine. 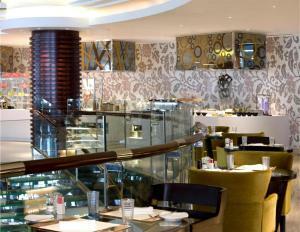 Both Western and Chinese dishes can be found Celebrity 24H Restaurant. Drinks can be enjoyed at the lobby bar. 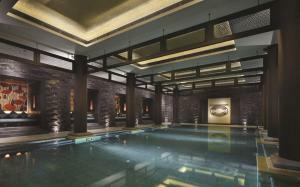 Guests can enjoy a foot massage or make use of the sauna facilities at Hotel Zhejiang. Free Wi-Fi is provided at this hotel. 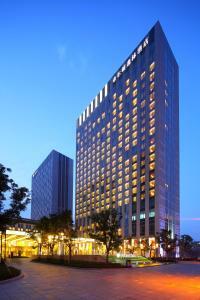 InterContinental Hangzhou is located in beautiful and scenic Hangzhou Qianjiang CBD. It is directly adjacent to Metro Civi Centre Station (Line 4). Featuring unique design and magnificent golden globe architecture, the hotel boasts scenic views of the Qiantang River from their rooms and a garden. Each spacious guestroom boasts floor-to-ceiling windows that offers panoramic views of the Qiantang River or city views, as well as the lighting show or musical fountain at the night. Every room is equipped with a coffee machine, well-stocked minibar, television, wireless and non-wireless Internet. With its 6,000 square metres of meeting and conference venues, InterContinental Hangzhou is the perfect setting for an inspiring meeting or event. A 1,780 square metres pillarless grand ballroom, a 1,000-people theatre hall, a city's unique conference hall with annular set-up, a press conference room and another 20 function rooms at your choice which make InterContinental Hangzhou the premier choice for high-level conferences, meetings and private events in the city. The hotel features 6 outstanding restaurants and bars with unique and distinctive designs. Sun & Moon Chinese Restaurant offers authentic Cantonese and local Hangzhou cuisines, with a variety stocks of fine wine. Fresh All Day Dining features its freshest ingredients and well-cooked buffet. 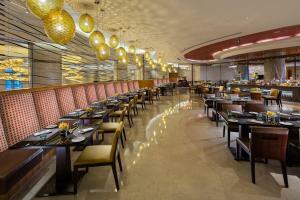 Senses Seafood Grill Restaurant is a perfect place for cuisine connoisseur, with Mediterranean cuisine and top wine. Connections Lobby Bar is designed for guests who have demands for high quality live music, featuring with great views and soothing music. Wochinger German Restaurant is famous for its fresh brewed beer and authentic German cuisine. Extra offer a pasta house serving authentic Italian pasta. Situated in Hangzhou, 5 minutes’ drive from Yuhang High-speed Railway Station, Grand New Century Hotel Yuhang Hangzhou features air-conditioned rooms and free private parking. Guests can enjoy the on-site restaurant. 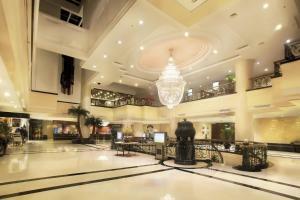 Grand New Century Hotel Yuhang features free WiFi throughout the property. Nanyuan Station of Subway Line 1 is 7 minutes’ walk away. West Lake is a 33-minute drive from Grand New Century Hotel Yuhang Hangzhou. Lingyin Temple is 50 minutes’ drive from the property, while Xixi Wetland is 45 minutes’ drive away. Hangzhou Xiaoshan International Airport is a 33-minute drive away. Every room includes a TV with satellite channels. Rooms are equipped with a private bathroom equipped with a bath. Extras include free toiletries and a hairdryer. There is a 24-hour front desk and concierge at the property. Guests can use the swimming pool as well as the fitness centre. A business centre is also available. Located in Qianjiang New Town, Holiday Inn features comfy accommodation with well-equipped modern facilities and chic décor, managed by Intercontinental Hotels Group. Steps from the commercial and shopping centres in Hangzhou city, it boasts a business centre with 6 natural light multi-function meeting rooms, an indoor pool and a spa centre. Free Wi-Fi is provided in public areas. 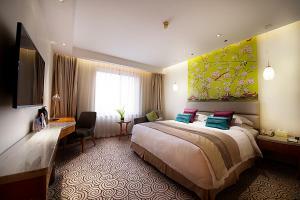 Holiday Inn is 2.5 miles from West Lake, China National Tea Museum or China National Silk Museum. It is 2.5 miles from Hefang Street, 4 miles from Wulin Square and 9.9 miles from Song Dynasty City. Xiaoshan International Airport is about 15.5 miles away. Offering views of Qiantang River, all units come with a minibar, a flat-screen satellite TV, an in-room safe, ironing facilities, a seating area with a sofa and a work desk. The en suite bathrooms have a bathtub, soft bathrobes and a shower. Chargeable Wi-Fi service is provided. Blending in by splashing around in the swimming pool, going cycling or lazing in the relaxing spa centre seems like a nice getaway. Luggage storage and currency exchange are available at the 24-hour front desk. The tour desk helps guests with organising day trips, bicycle rentals and ticketing services. Buffet for breakfast and lunch is served daily. Hotel full-time restaurant will serve selected Asian and western dishes. An a la carte restaurant is also available for dinner.